From its opening in 2009, the High Line park has not only been a magnet for tourists and New Yorkers, but more significantly real estate projects. Among the 30 developments in the works, a notable one from the Related Companies has emerged, featuring starchitect Zaha Hadid. She is known for being the first woman to win the Pritzker Prize in 2004, architecture’s top recognition. Her works can be seen around the world and feature the Olympics’ Aquatics Center in London as well as the Opera House in Guangzhou, China. With the upcoming condominium project at 520 West 28th Street, Zaha Hadid’s style featured in 40+ countries will finally have a footprint on the Manhattan ground and skyline. 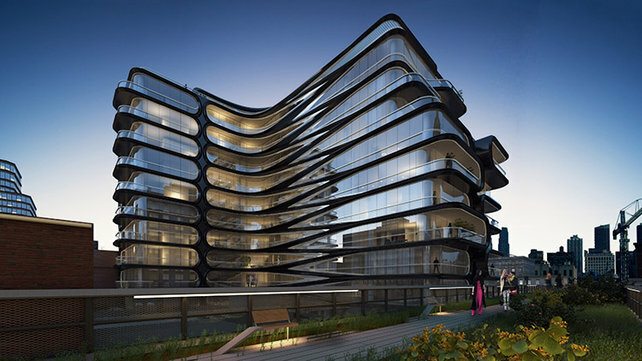 This 11-story building’s construction will be made of steel and glass, and its design will carry on curvy lines with set backs, and Hadid’s signature space-age style. The project consists of 37 apartments of up to 5,500sf with each of them offering “an arrangement that reinvents the spatial experience, each residence will have its own distinctive identity, offering multiple perspectives and exciting views of the neighborhood”. The residents will enjoy a private courtyard, a rooftop, indoor pool and spa as well as a playroom. Units will feature 11ft ceilings and top amenities, with some having a private keyed elevator access. For her first New York project, this is quite a statement already, and hopefully, one that will repeat.